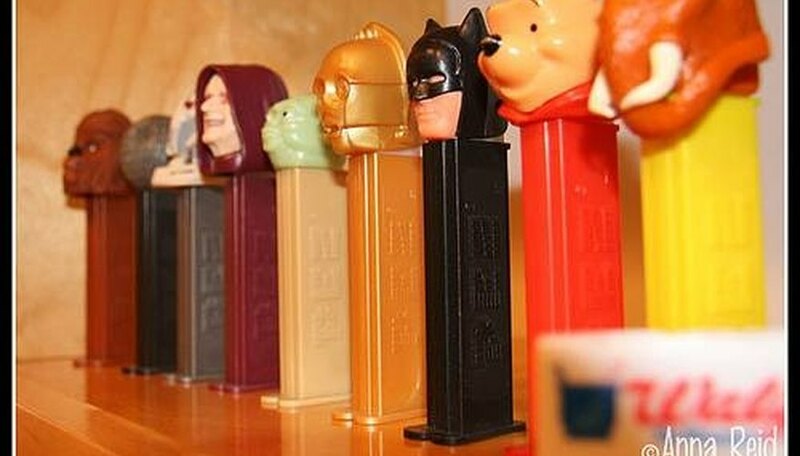 If you're a Pez collector, then you already know how difficult it can be to find the perfect type of shelf to display your collection. Standard shelves tend to be too wide and bulky causing dispensers to slide off. Use these steps to create a custom display shelf that will hold your dispensers and provide you with easy access to them. Decide how many dispensers you want your shelf to hold. Since Pez dispensers are so small, you can easily create a shelf unit that holds a hundred or more. Decide if you want to leave empty spaces for additional dispensers if you plan to expand your collection. Create a basic design. Use the number of dispensers you want to display as your guideline for the dimensions of your display shelf. Plan for 3 inches per dispenser. If you want to display 100 dispensers, divide that number by the number of shelves you want to have in your unit. For example, you can display 20 per shelf and have 5 shelves. Each shelf would be 60 inches wide (20 dispensers times 3 inches). Or you can display 15 per shelf, have 7 shelves 45 inches wide (15 times 3 equals 45), and display 105 dispensers (15 times 7). Plan the frame around the shelves. The shelves should be 10 to 12 inches apart from each other. One shelf will also serve as the bottom of your frame. Draw a simple sketch to show how your shelves will be spaced and what the total height of your display shelf will be. For example, for the five-shelf option, you would need a total height of 60 inches--the bottom shelf is the bottom of your frame, each additional shelf is spaced at least 12 inches apart, and there is a top frame piece at 12 inches above the uppermost shelf. So for the frame itself, you need the bottom shelf piece, a top piece of equal size to the bottom shelf, and two side pieces of 60 inches each. Purchase the materials. For the five shelf unit, you need eight pieces of wood that are all 60 inches in length--five are shelves and three complete the frame. The wood should be 3 to 5 inches deep. Look for wood trim or plain baseboard at a hardware store. Purchase enough to create the eight pieces you need. For each shelf, you will also need a dowel rod of equal length to the shelf. This serves as a holder to keep your dispensers from falling out of the display shelf. Construct the display shelf. Mark the spacing for the shelves and the top frame piece on the piece of wood that will serve as a side to your frame. Nail the shelves and the top frame piece to the side frame piece by nailing from the outside of the frame and into the end of each shelf. Use two or three nails for each shelf. Repeat with the other side piece. Install the dowel on the frame. Slide each dowel rod until it is wedged into place about midway above each shelf. You may need to sand the edge off just a little bit so that the dowel rod slides in, but don't sand too much or it will not stay in place. Alternately, you can drill a hole through the side frame pieces at the point where you want each dowel rod to sit and insert the dowel through the holes, using glue just around the inner edges of the hole to secure the dowel into place. Install hanging hardware on the back of the display shelf, on both corners of the top frame piece.